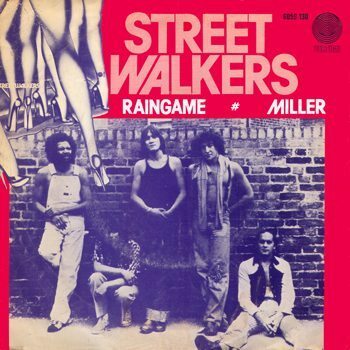 This was the first full-fledged Streetwalkers album, with a backing band and the characteristic second vocals of Bob Tench. 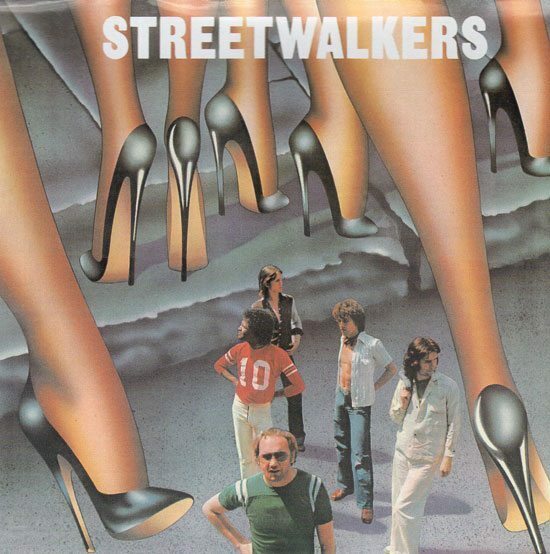 The US release was called “Streetwalkers” while the UK (and Europe?) 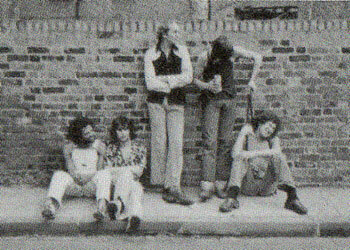 title was “Downtown Flyers”, presumably because the 1st album didn’t make it to the US. The title track kicks it off, and I mean KICKS. Never had Family been this “catchy” in their songwriting, for reasons both good and bad. Funk-guitar intro (with two guitars) is followed by a go-for-the-throat angular riff. They really got the band-sound they wanted with this solid line-up. When the verses come in, all of the elements sound like they are circulating, especially with the echoed guitar lines. 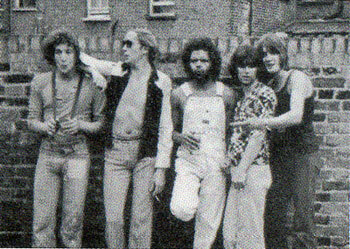 The song describes hanging with the working class type that Chappo and Co. love to portray. The Tench vocals are nice and prominent, and there is a cheesy bit of talk-box before the quick chorus. This song is great in that with the mixed song stages, they seem to have just the right amount of “cool”. Something they had a problem with in other songs. Not concentrating enough on the sweet parts, and too much cheese creeps in. Fade-out with the chorus lines. The album continues with another dense double-guitar hook, and some excellent throw-down verses from Chapman. Charlie’s slide is on fire in this one. Recently I found a connection between this song and Atlanta bluesman Blind Willie McTell. Excellent 12-string riff in this one… Hard rock indeed. Led Zeppelin, ca. 1976, comes to mind. A strong tight song; they didn’t fluff it up thankfully. A gentle ballad featuring synthesizer from Poli Palmer. “Walking On Waters” was something of an epic for them. The mundane verses remind me of Chapman’s future solo career, but the choruses are most powerful, and the vocals really go overboard here. One of the silkier moments found in Streetwalkers songs. Whispering acoustics, and Chapman really sounds like a different singer, hitting some of the lowest notes I’ve heard him do! Some sharp lap-steel lines come in for an electric solo. The tune is almost an on-the-spot jam. Some electric piano from Max Middleton. Drums enter at the end section, but very controlled like the rest. “Burn It Down” was another favorite, and features some great piano banging. Roger’s singing with himself on this one (Rolling Stone criticized SW for underutilizing Bob Tench as a second vocalist), but when you’ve got one of the great voices in Rock, why not use it twice? What helps make him so effective as a vocalist is he’s typically singing a song about life on the streets, and sounds like he’s spent his share of nights in the gutter. A definite highlight. Probably the one musical style that seemed most in common with Family are the SW ballads. And as much fun as the raw rockers are, C&W could certainly craft a solid acoustic-based piece. What’s often overlooked is how well Chappo can handle a more traditional (dare I say?) crooning. Former Family member Poli Palmer contributes some good synth work. Another mellow SW song. Chappo trades vocals with himself, which harkens back to the Rolling Stone criticism. To be sure, Bob Tench had the credentials for broader use (former lead vocalist for the Jeff Beck Group) and certainly was used effectively in other tracks. But this one works well as an RC vehicle, and since Tench’s more traditional electric guitar style made a nice contrast to CW’s slide, it seems fair to say that overall Tench was a key contributor to the SW sound. One of the top two or three tracks on this album, and one of SW’s best. The music is gritty, the vocals even more so. In addition to his typical throat-full-of-gravel delivery, RC adds some very effective phrasing into the mix. Max Middleton joins in on keyboards. Although SW covered a variety of styles, it’s songs like this that twenty years later seem to best epitomize their work.